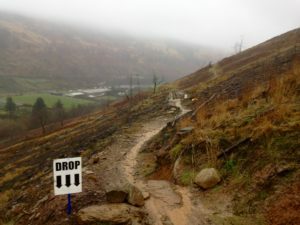 We have 5 stages for round 3: 3 for the normal Mtb’s and 2 extra uphill flow stages for the E-Mtbs The Emtb stage will consist of 2 Uphill flow sections with a neutral section in the middle. Helmets must be worn and fastened while riding. This includes transitions and carparks! 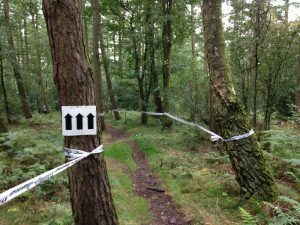 THERE WILL BE WORKERS ON THE STAGES/TRAILS THE WEEK LEADING UP TO THE RACE PREPARING THEM FOR THE EVENT. IF YOU ARE PRACTISING OR RIDING PLEASE BE AWARE YOU MAY COME ACROSS WORKERS WITH EAR DEFENDERS ON, THEY WILL NOT HEAR YOU. NO WALKING/PUSHING UP TRAILS TO SECTION, THE TRAILS ARE OPEN TO THE PUBLIC. THERE HAVE BEEN A FEW COMPLAINTS ALREADY. Please listen to all the marshal’s instructions and keep all pets on a lead and under control. Remain outside of the course tape. Please be aware of where you are standing at all times. Dogs must be kept on a lead. Failure to comply will result in suspension of the racing until it is deemed safe to continue. Parking on race day is around the lodge area and up in the main camping field. Please DO NOT on the entrance road or around the forest entrance gate. There are timber haulage trucks using it and they don’t say sorry. 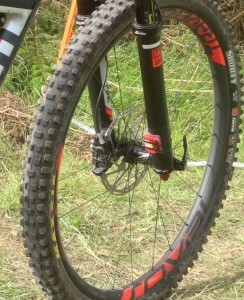 * “Six Feet Under” section of stage 2 is a temporary event trail, please do not ride before the event. Ebikes must be bought to sign-on on the day of the race for inspection before commencing racing. All ebikes must adhere to the pedalec rules and be limited to 25km/h random checks will also be undertaken. Failure to comply will result in disqualification. Stages 1,2,3 & 4 will be marked for Saturday. You are free to ride them but be aware that they are all open to the public. Ride within your limits and respect the Forest code. You can ride the stages in any order you like and as many times as you like with each run being timed! you’re best times will count towards to the overall results. All stages will be timed from 10:30-15:30 look for the Start boards to signify the start of a timed section and the finish boards to mark the end,please listen to marshals. YOU MUST ONLY DO COMPLETE RUNS OF ANY STAGE, NO SECTIONING DURING LIVE TIMING!! YOU WILL BE INSTANTLY DISQUALIFIED IF CAUGHT. If you do catch someone on stage then shout “Rider” to forewarn them, then as you come closer shout “Rider Left” or “Rider Right” left or right being the side that YOU will pass them on, please be patient and don’t forget you’ll get another go as long as the stage is open. 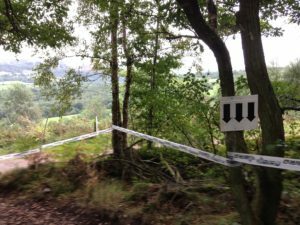 If you see a RED FLAG being waved on stage you must stop safely and pull off the trail and wait for instructions from the marshals. Motocross bikes can be an issue in this area so please be aware that they may be present, if you come across them tell a marshal asap. If you are not bothered with live times then wait till after the race and all your times will be posted up at sign on and on the live timing screen. *Attendance of the prize giveaway on the day of the event is compulsory! or you will forfeit your prize. For the Mountain Bike Chalet : If the chosen rider is not in attendance, the prize will be given to the next person in the overall rankings who is in attendance at the prize ceremony. No exceptions! Medics: Remote Medical Services will be on site Sunday from 09:30-15:30, they will have medics out on the hill on call.